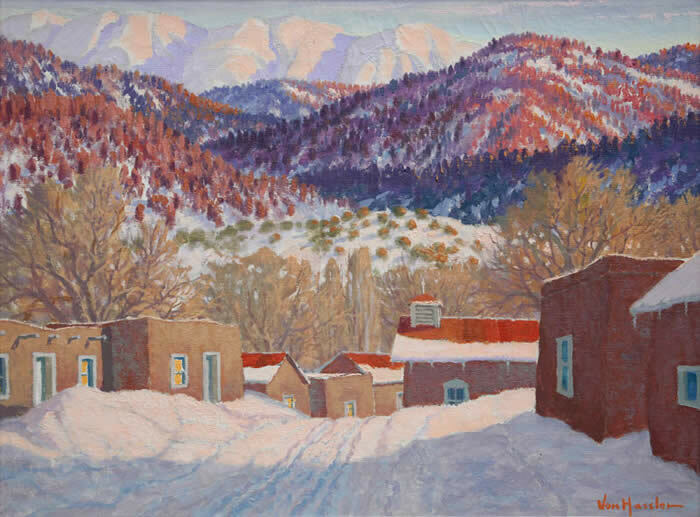 Carl von Hassler, Top: Sundown in Winter, March 27, 1939 Oil on Canvas 18" x 24", Foothills Sangre De Christo Range New Mexico. 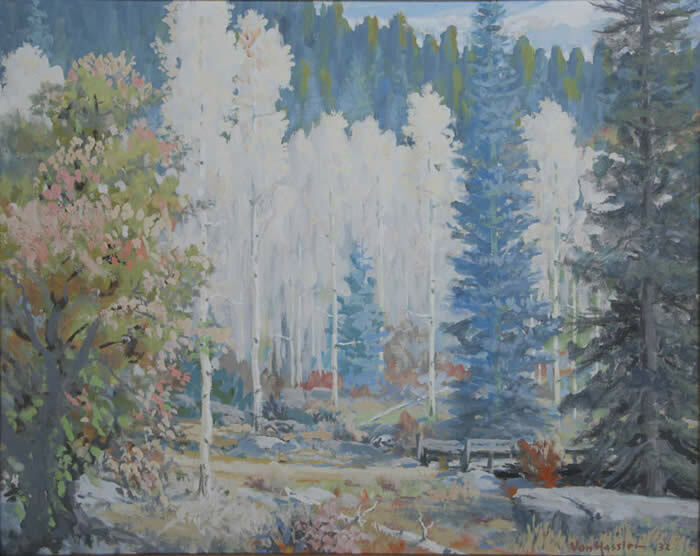 Bottom: Aspens, c. 1932, Tempra on Board, 16" x 20"
Von Hassler experienced another life-altering event two years later when he attended a performance of Buffalo Bill's Wild West Show. His father, a prominent businessman, had helped bring the temporarily bankrupt troupe to Bremen. Thats when I first decided to go to America, he recalled. 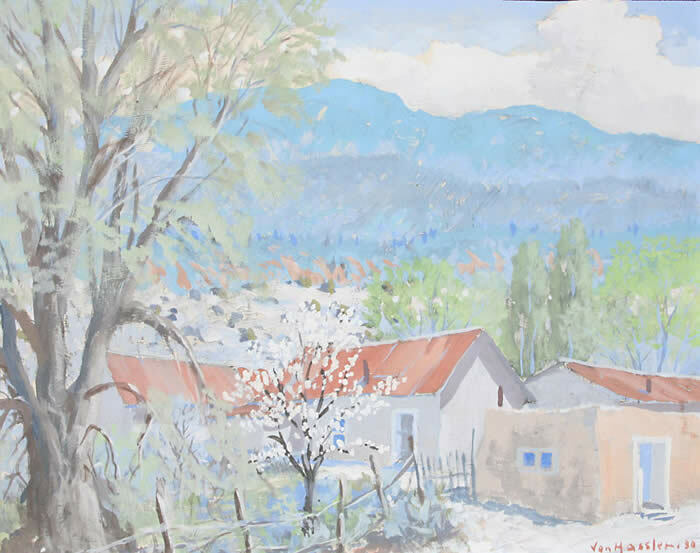 That opportunity to go abroad finally arrived in 1912 after he finished his naval service and also completed six years at the Düsseldorf Art Academy. 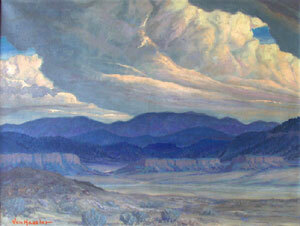 Carl von Hassler, Top: Looking Towards Jemez, Oil on Canvas, 27" x 36" Bottom: Fast Moving Clouds, c. 1937, Oil on Canvas, 26" x 34"
Carl von Hassler, Top: Navajo Woman, c. 1920 Acid Tempera, 16" x 14" Bottom: Fall Colors, Oil on Paper, 13" x 18"
Carl von Hassler, Top: Springtime New Mexico Valley, c. 1930, Acid Tempra, 16" x 20" Bottom: Autumn Splendor, c. 1930, Egg Tempera, 12" x 16"
Carl von Hassler, Autumn in the Penasco Valley, c. 1932, Oil on Panel, 14.5" x 18.5"
Top: Monument Valley, Utah / Arizona. Bottom: Arches Monument, Utah. 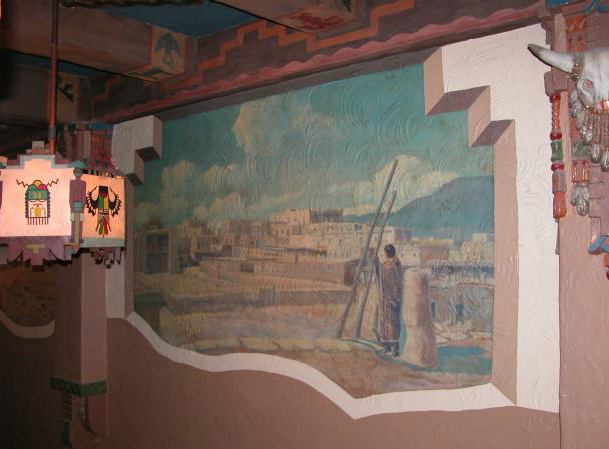 1996 artist's rendering of missing Carl von Hassler murals by Jeff Benham, Kimo Theatre, Albuquerque, New Mexico.A section of the "Seven Cities of Cibola" murals was destroyed in the late 1930s to create an upstairs window booth for KGGM radio. There are only two partial photographs known of the original. They were titled after the mythical seven cities of gold searched for by Francisco Coronado. 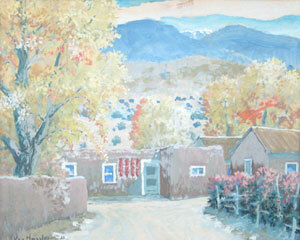 To learn more, visit http://www.cabq.gov/kimo or http://www.virtualalbuquerque.com/VirtualABQ/KimoTheater/ for a virtual tour. Top Left: White House Ruins, Canyon de Chelly, Arizona. 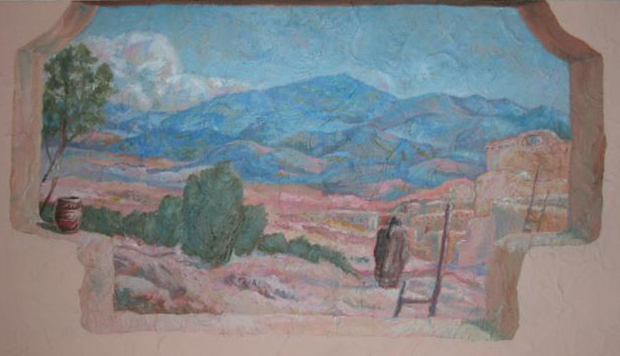 Top Right: Bandelier Monument near Los Alamos, New Mexico. 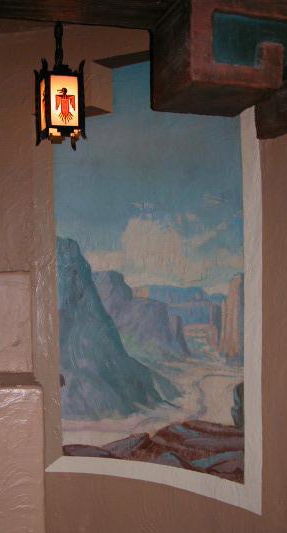 Bottom left and right: two other murals representing the "Seven Cities of Cibola." 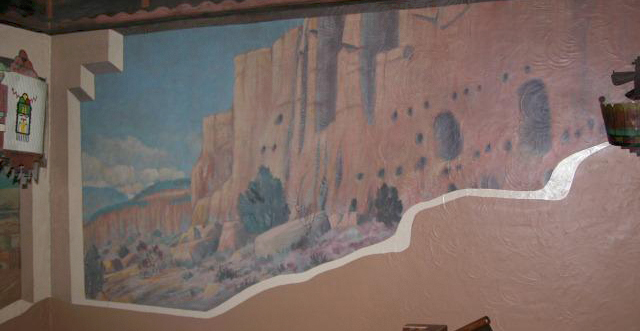 1996 artist's rendering of missing Carl von Hassler murals by Jeff Benham, Kimo Theatre, Albuquerque, New Mexico. 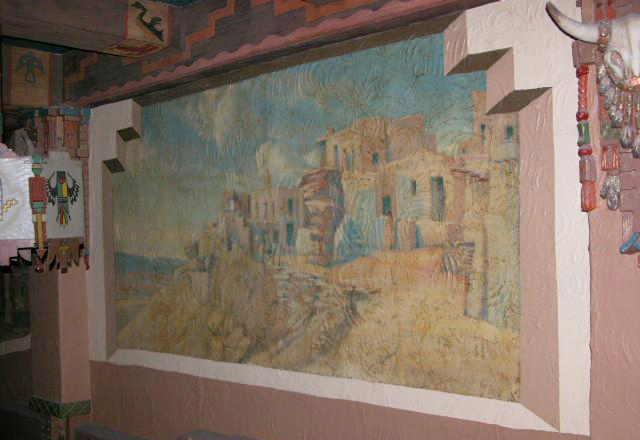 A section of the "Seven Cities of Cibola" murals was destroyed in the late 1930s to create an upstairs window booth for KGGM radio. There are only two partial photographs known of the original. They were titled after the mythical seven cities of gold searched for by Francisco Coronado. To learn more, visit http://www.cabq.gov/kimo or http://www.virtualalbuquerque.com/VirtualABQ/KimoTheater/ for a virtual tour. 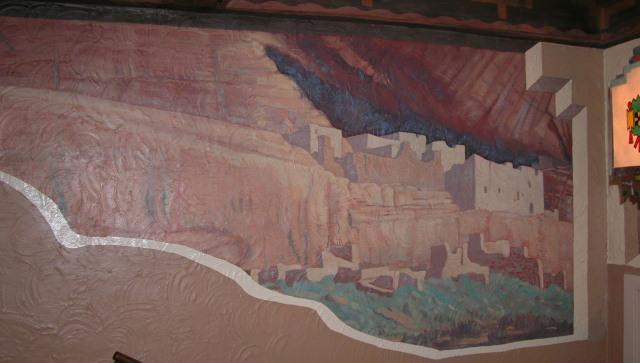 Top Left: Acoma "Sky City" near Grants, New Mexico. 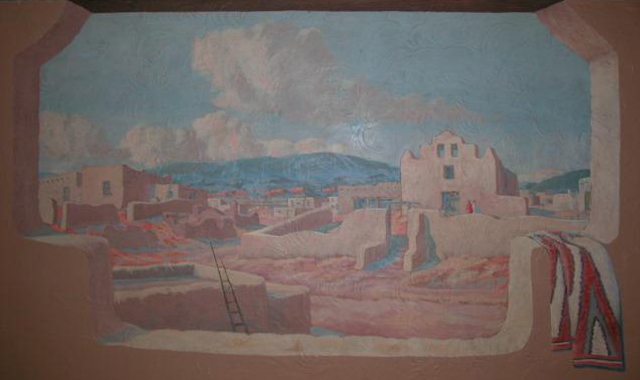 Top right and bottom: two other murals representing the "Seven Cities of Cibola." 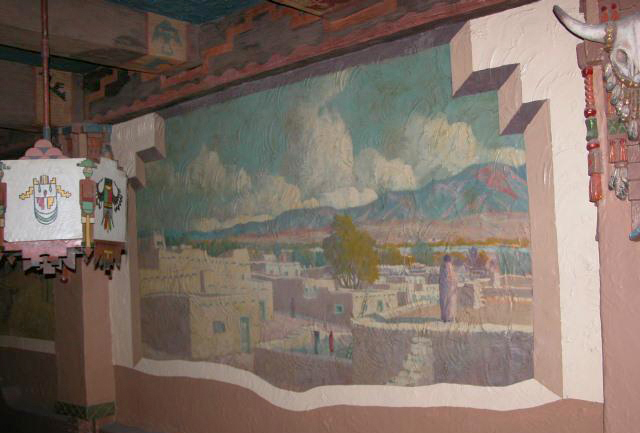 1996 artist's rendering of missing Carl von Hassler murals by Jeff Benham, Kimo Theatre, Albuquerque, New Mexico. 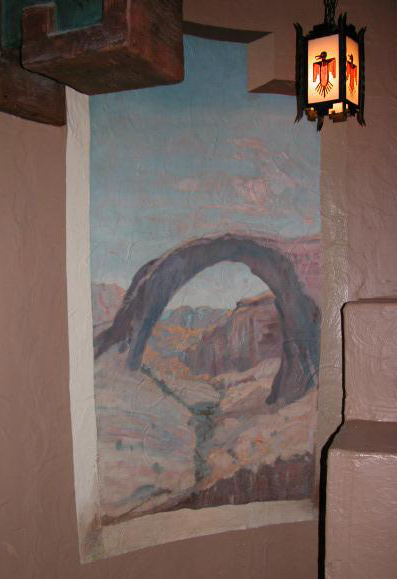 A section of the "Seven Cities of Cibola" murals was destroyed in the late 1930s to create an upstairs window booth for KGGM radio. There are only two partial photographs known of the original. They were titled after the mythical seven cities of gold searched for by Francisco Coronado. 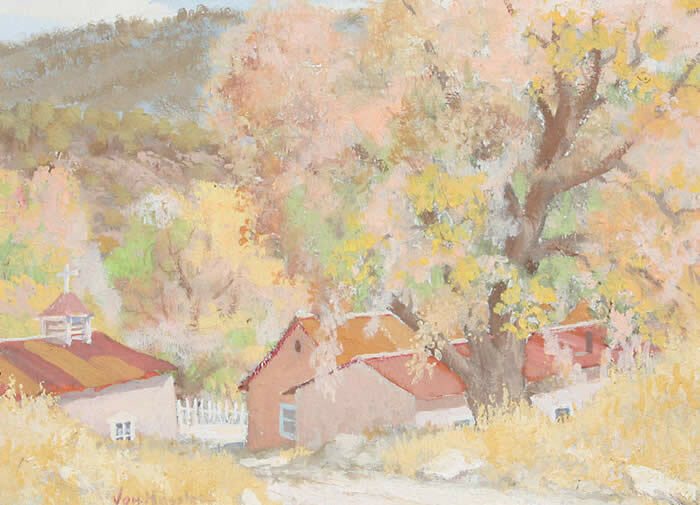 To learn more, visit http://www.cabq.gov/kimo or http://www.virtualalbuquerque.com/VirtualABQ/KimoTheater/ for a virtual tour. When Carl von Hassler died in 1969, his students fondly remembered him as a stern and demanding teacher, but one who got results. 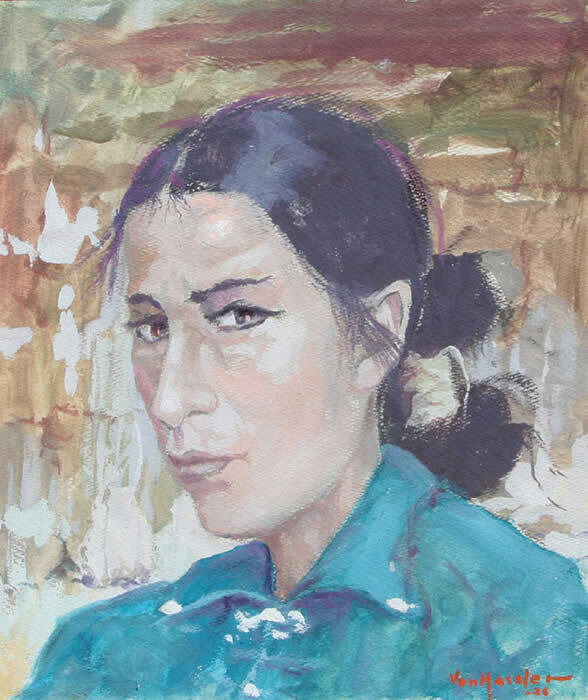 he was a disciplinarian as a teacher and an artist. Most important, he demanded patience and self-discipline in our work, two students recalled. 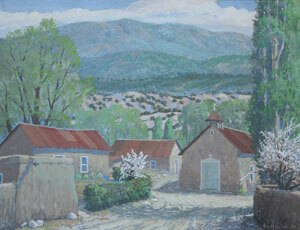 But this was no less than he demanded of himself, always reinforcing his art with his constant search for knowledge. 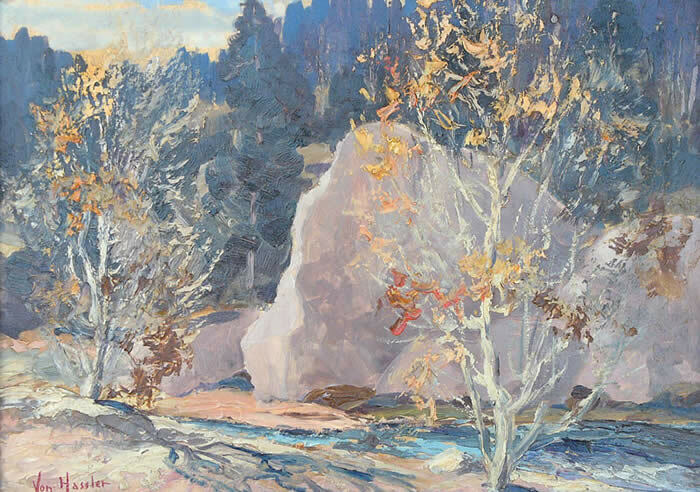 Walter Bambrook, reminisced about von Hassler and his most famous student: Ben Turner and I would go on sketching trips with Carl back in the early thirties... He was always learning something new about New Mexico. He never stopped learning. 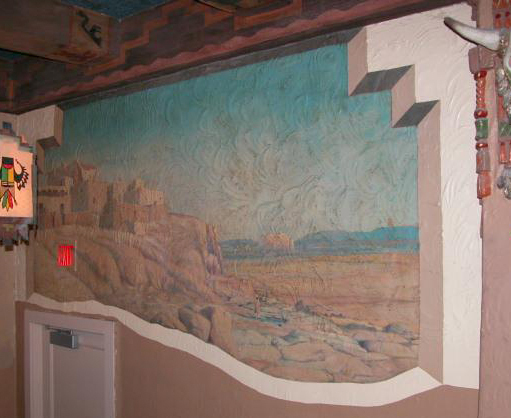 1996 artist's rendering of missing Carl von Hassler murals by Jeff Benham, Kimo Theatre, Albuquerque, New Mexico. 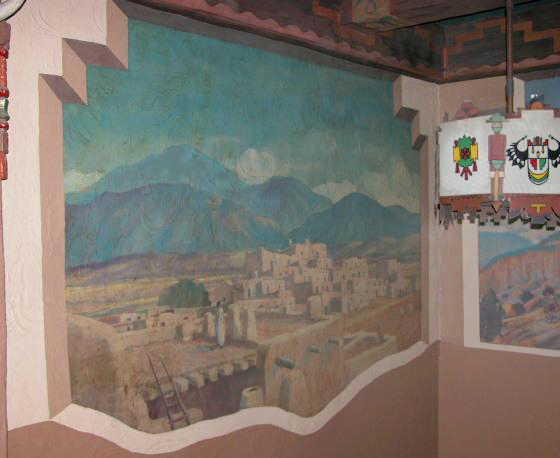 In the late 1930s for the image on the bottom and 1940-50s for the image on the top, a section of the "Seven Cities of Cibola" murals was destroyed to create an upstairs window booth for KGGM radio. There are only two partial photographs known of the original. They were titled after the mythical seven cities of gold searched for by Francisco Coronado. To learn more, visit http://www.cabq.gov/kimo or http://www.virtualalbuquerque.com/VirtualABQ/KimoTheater/ for a virtual tour.